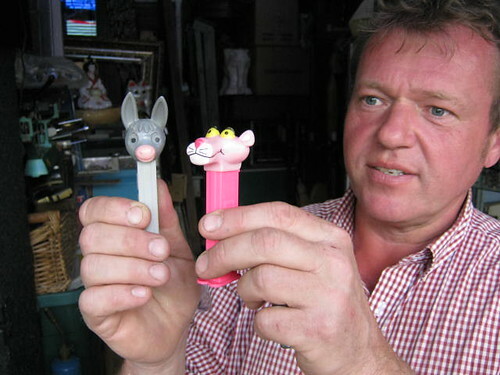 Pink Panther PEZ Dispenser, and Shrek Donkey PEZ Dispenser, are two models have been earmarked by Steve Reynolds as hot collectibles for the future. He has his reasons for taking them out of the original packaging – how else can he play with them? Thanks Steve Reynold for giving up a matter of time to show me around your store. I wrote about my own encounter with a Pink Panther PEZ Dispenser on Robsome, and that rendition grew larger and then transformed itself into an article on Dumpdiggers. My own unmitigated passion for the past has propelled me closer to Collecting PEZ Dispensers in the Dumpdiggers Library. I also started a thread on the Dumpdiggers discussion forum inviting folks to upload pictures of their own PEZ collections. 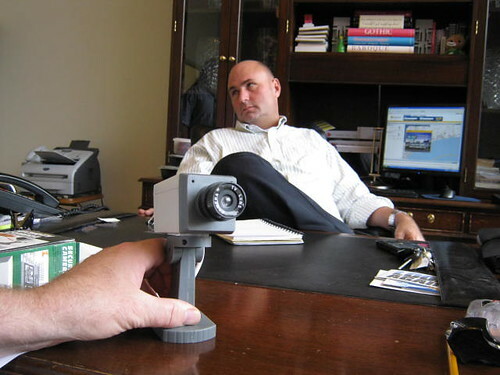 Paul Kenyon sits behind a great big desk at 185 Eastern Avenue in Toronto. The words Portable Luxury imply a strange request for images of ‘luxurious convenience’. So its safe to assueme the Lenzr admin intends to collect shots of things people can take with them if they are ‘on the run’; objects people can use to get comfortable somewhere else in the world. The Portable Luxury photo contest on Lenzr is looking for handheld luxury items. How do you move your comfort zone? The prize is a Las Vegas vacation for two people courtesy of the portable toilet rentals company sponsor that’s arranged to provide airfare and hotel accommodation for two people for three days and two nights in Las Vegas. This entry was posted in Ontario, portable toilets, Toronto, Web Marketing and tagged candy, collectible, Paul Kenyon, PEZ dispensers, Pink Panther, portable toilet rentals, Shrek Donkey PEZ. Bookmark the permalink. Great stuff! I’m really interested in learning more about this!